Home ALYZ HENRICH BEA SANTIAGO BEAUTIES MISS INTERNATIONAL NATHALIE DEN DEKKER PAGEANTS Miss International 2013 Winner is crowned..and she's Miss Philippines! Miss International 2013 Winner is crowned..and she's Miss Philippines! Miss International 2013 winner has been crowned and she's no less than Miss Philippines Bea Rose Santiago. The 53rd edition of Miss International was held at the Shinagawa Prince Hotel Hall in Tokyo, Japan, with 67 contestants competing for the crown. Final and official results have been posted below. 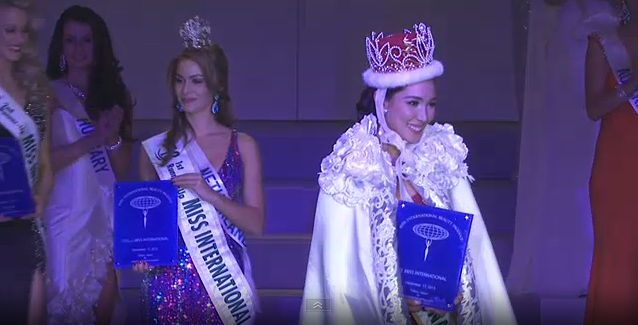 Two big favorites indeed emerged as the Top 2 winners: the Philippines' Bea Rose Santiago as Miss International 2013 winner and the Netherlands Nathalie Den Dekker as 1st Runner Up, with the latter having an extra edge when it comes to beauty pageant experience. It was Den Dekker's 5th time already to represent the Netherlands in a beauty pageant. She already won for the country the Miss Tourism International 2010 crown, and also previously joined Miss Supranational 2010, Miss Universe 2012 and Miss World 2012, where she landed in the Top 15. Santiago on one hand already wore the Philippines sash during the Miss Tourism Queen of the Year International 2012 and was among the Top 10 semi-finalists. Both gorgeous and well-prepared, but it was probably Miss Philippines' very impressive, strong and heartfelt speech during the Top 5 that persuaded the judges to give her the crown. As you can see, the host candidate, Miss Japan Yukiko Takahashi, failed to make it to the Top 15, as well as favorites like Miss Mexico Lucero Montemayor and Miss Venezuela Elián Herrera. It was only the 10th time that the Japanese delegate did not reach semis of the Japan-based pageant. The last time was in 2011. Miss Venezuela not being part of the Top 15 is a big disappointment for her country, considering that 3 other winners of Miss Venezuela 2012 pageant went on to become titleholders in the respective pageants where they competed this year and she's the only one who lost or didn't even reach semi-finals. Miss Venezuela Universe 2012 María Gabriela Isler was crowned Miss Universe 2013, Miss Venezuela Earth 2012 Alyz Henrich became Miss Earth 2013 and the 1st Runner-Up, Ivanna Vale, won Reinado Internacional del Café 2013. Even one Miss Venezuela 2012 clapper, Daniela Chalbaud, competed at Miss Intercontinental 2012 and then won.